Robinsons' spacious Lean To greenhouse can be fixed to most walls, although a southerly aspect is preferable. When space is limited or you would like your greenhouse to be close to your house, a Lean-To can be the answer. The wall that the Lean-To is attached to acts like a radiator for the greenhouse - absorbing the sun's heat throughout the day and slowly releasing it at night. Whether used as a greenhouse or as somewhere to sit on a fine day, the Lean - to greenhouse will give you many years of pleasure. Please be aware that Lean To greenhouses are not guaranteed to be watertight and can not take the place of a properly sealed conservatory. 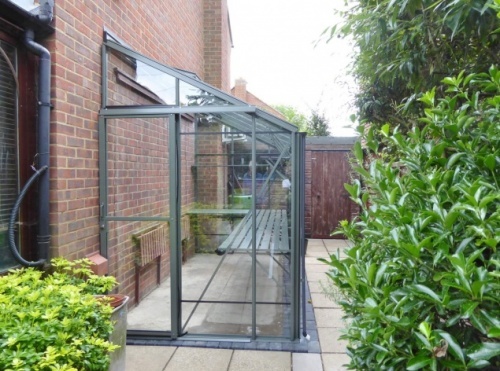 If you install a lean to greenhouse over an entrance to your home it must be glazed with toughened safety glass and you can rest assured that Robinsons greenhouses conform to these standards. As with all Robinsons' greenhouses, the Lean-To includes 4mm toughened safety glass which complies with British Standard BS 6206 Class A. The glass is four times stronger than ordinary glass of the same thickness. The door of the Robinsons Lean To greenhouse can be fitted at either end. If you choose a 6ft 5in model, the extra height enables you to position the door on the side of the building.